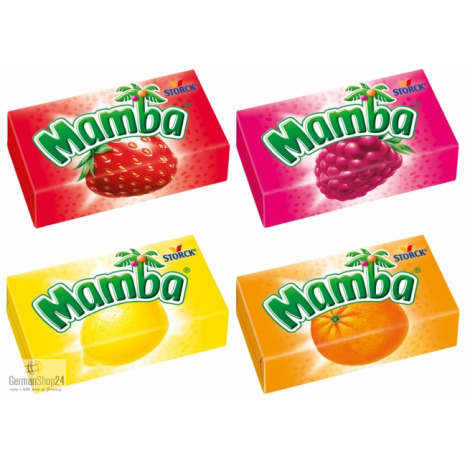 Individually wrapped chewy candy pieces in the flavors strawberry, raspberry, lemon and orange. Fruity fresh since 1953! Mamba is one of the oldest Storck brands, and it is still loved by kids of all ages. 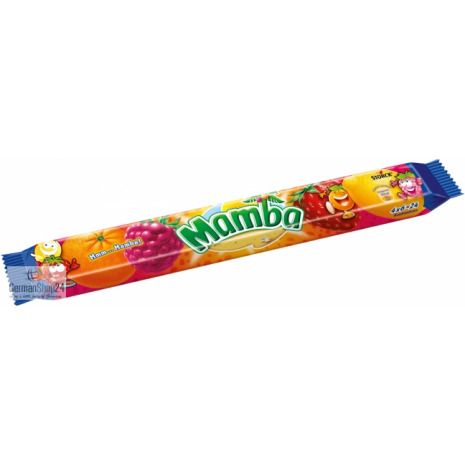 When Mamba was launched in 1953 in Germany, most people didn't have a lot of money for treats. 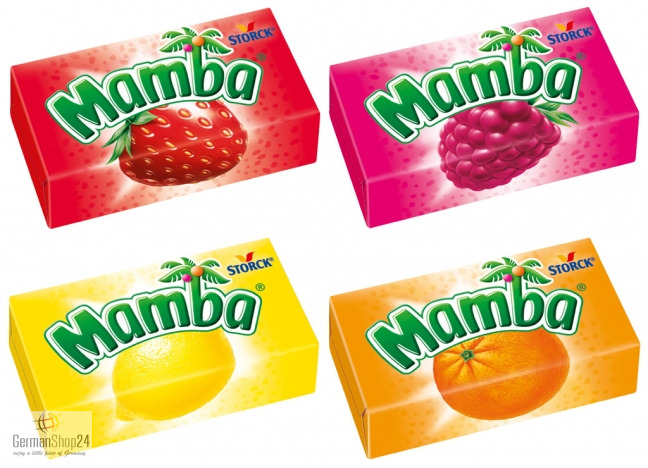 Each small Mamba pack contained six pieces of candy and was affordable for everyone. People loved them for their great taste and their price. The small chewy candy pieces come in the flavors strawberry, raspberry, lemon and orange. Glucose syrup, sugar, palm fat, humectant sorbitol syrup, modified starch, citric acid, flavors, coloring black carrot from concentrate, caramel sugar syrup, emulsifier polysorbate-60, coloring turmeric extract, antioxidant alpha-tocopherol. Glukosesirup, Zucker, Palmfett, Feuchthaltemittel Sorbitsirup, modifizierte Stärke, Säuerungsmittel Citronensäure, Aromen, färbendes Schwarze Karottenkonzentrat, Karamellzuckersirup, Emulgator E435, färbender Kurkuma-Auszug, Antioxidationsmittel Alpha-Tocopherol.